The larynx has a triple function, that of an open valve in respiration, that of a partially closed valve whose orifice can be modulated in phonation, and that of a closed valve, protecting the trachea and bronchial tree during deglutition. Coughing is only possible when the larynx can be closed effectively. The structures which form its framework are the epiglottis, thyroid cartilage, cricoid and the arytenoids (Fig. 205). The larynx is slung from the U-shaped hyoid bone by the thyrohyoid membrane and thyrohyoid muscle. The hyoid bone itself is attached to the mandible and tongue by the hyoglossus, the mylohyoid, geniohyoid and digastric muscles, to the styloid process by the stylohyoid ligament and muscle and to the pharynx by the middle constrictor. Three of the four strap muscles of the neck, the omohyoid, sternohyoid and thyrohyoid, find attachment to it, only the sternothyroid failing to gain it. The epiglottis is a leaf-shaped elastic cartilage lying behind the root of the tongue. It is attached anteriorly to the body of the hyoid by the hyoepiglottic ligament and below to the back of the thyroid cartilage by the thyroepiglottic ligament immediately above the vocal cords. 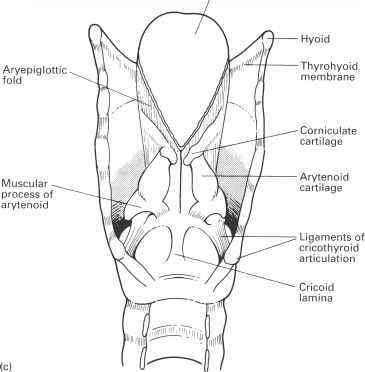 The sides of the epiglottis are connected to the arytenoids by the aryepiglottic folds which run backwards to form the margins of the entrance, or aditus, of the larynx. The upper anterior surface of the epiglottis projects above the hyoid bone; the epiglottic mucosa is reflected forward to the base of the tongue and is raised up into a median glossoepiglottic fold and lateral pharyn-goepiglottic folds. The depression on either side between these folds is termed the vallecula. The thyroid cartilage is shield-like, being made up of two lateral plates meeting in the midline in the prominent 'V' of the 'Adam's apple', the laryngeal prominence, which is easily visible in the postpubertal male. The cricoid is signet-ring shaped, deepest behind. It is the only complete ring of cartilage throughout the respiratory tract. Inferiorly, it is attached to the trachea by the cricotracheal membrane. The arytenoids sit one on each side of the posterior 'signet' of the cricoid cartilage. In addition, there are two small nodules of cartilage at the inlet of the larynx; the corniculate cartilage, a nodule lying at the apex of the arytenoid, and the cuneiform cartilage, a flake of cartilage within the margin of the aryepiglottic fold. These are of no functional importance. They are, however, seen when the larynx is inspected through a laryngoscope (see Fig. 207) and, to the uninitiated, might mimic pathological nodules. 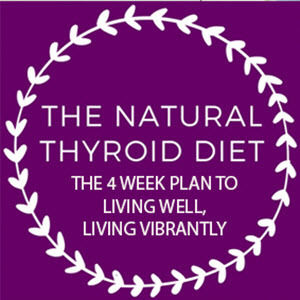 The circothyroid membrane (cricovocal membrane) connects the thyroid, cricoid and arytenoid cartilages. It is composed mainly of yellow elastic tissue. Its upper edge is attached anteriorly to the posterior surface of the thyroid cartilage and behind to the vocal process of the arytenoid. Between these two structures, the upper edge of the membrane is thickened slightly to form the vocal ligament. Anteriorly, the membrane thickens, as the cricothyroid ligament; this is subcutaneous, easily felt and is used in emergency cricothyroid puncture for laryngeal obstruction. Passing forward from the arytenoid to the back of the thyroid cartilage, just below the epiglottic attachment, are two folds of mucosa. The upper is the vestibular fold, containing a small amount of fibrous tissue and forming on each side the false vocal cord. The lower fold (the vocal fold or cord) contains the vocal ligament (Fig. 206). Fig. 206 (a) The internal structure of the larynx— the lamina of the thyroid cartilage has been cut away. (b) The larynx dissected from behind, with cricoid cartilage divided, to show the true and false vocal cords with the sinus of the larynx between. 3 the subglottic compartment between the true cords and the first ring of the trachea. On either side of the larynx the pharynx forms a recess, the piriform fossa, in which swallowed foreign bodies tend to lodge. The muscles of the larynx function to open the glottis in inspiration, close the vestibule and glottis in deglutition and alter the tone of the true vocal cords in phonation. The cricothyroid (Fig. 203) is the only external muscle of the larynx and tenses the vocal cord (the only muscle to do so), by a slight tilting action on the cricoid. It is supplied by the superior laryngeal nerve. Fig. 206 (Continued). (c) The cartilages and ligaments of the larynx seen posteriorly. thyroarytenoid, posterior and lateral cricoarytenoid, the aryepiglottic, thyroepiglottic and interarytenoid muscles. These are all supplied by the recurrent laryngeal nerve. All these muscles except one have a sphincter action; the exception is the posterior cricoarytenoid on each side which, by rotating the arytenoids outwards, separates the vocal cords. The larynx receives a superior and inferior laryngeal artery from the superior and inferior thyroid artery respectively. These vessels accompany the superior and recurrent laryngeal nerves. Above the vocal cords the larynx drains to the upper deep cervical and then to the mediastinal lymph nodes, some lymphatics passing via small nodes lying on the thyrohyoid membrane. Below the cords, drainage is to the lower deep cervical nodes, partially via nodes on the front of the larynx and trachea. The vocal cords themselves act as a complete barrier separating the two lymphatic areas, but posteriorly there is free communication between them; a laryngeal carcinoma may thus seed throughout the lymphatic drainage area of the larynx. What is sphincter of aditus? Is there submucous tissue in vocal cord?